Embassy Suites by Hilton Scottsdale Resort features 2 spa tubs and a health club. Wireless Internet access is complimentary. A business center is on site at this 3.5-star property. Guests can enjoy a complimentary breakfast each morning as well as a complimentary manager's reception. This business-friendly hotel also offers gift shops/newsstands, laundry facilities, and dry cleaning/laundry services. Complimentary valet parking is available on site. A total renovation of this property was completed in 2016. 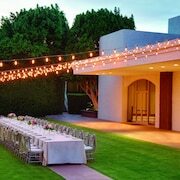 Located in South Scottsdale, this hotel is within a 15-minute walk of Old Town and Scottsdale Fashion Square. Scottsdale Waterfront and Scottsdale Stadium are also within 2 mi (3 km). This hotel features a health club, a conference center, and self parking. Free buffet breakfast is provided, as well as free WiFi in public areas, free valet parking, and a free manager's reception. Other amenities include a business center, dry cleaning, and laundry facilities. 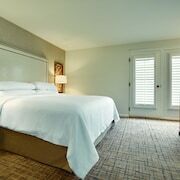 All 312 rooms feature conveniences like sofa beds and microwaves, plus laptop-compatible safes and phones. 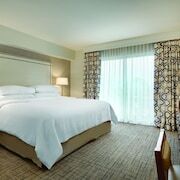 Embassy Suites by Hilton Scottsdale Resort offers 312 accommodations. Business-friendly amenities include laptop-compatible safes and phones. Guests are offered a complimentary buffet breakfast each morning. A complimentary manager's reception is offered each day. Granada Bar & Grill - This restaurant specializes in American cuisine and serves dinner only. A children's menu is available.